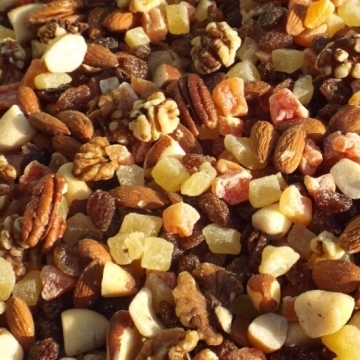 Contains: Brazil kernels broken, Pineapple diced, Sultanas, Walnut kernel halves, Almond kernels, Papaya diced, Pecan halves, Apricots chopped. The average score is 10 out of 10. This is a good mix, which the parrots like. My parrots love these as special treats! Fantastic quality!